Hey, this is Jason. 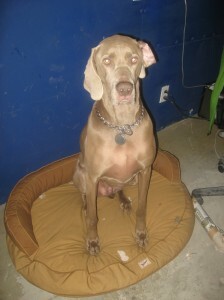 No, it wasn’t Take Your Dog To Work Day but my three year old weimeraner Logan recently spent the day at Filmaka. After spending the first half hour sniffing unfamiliar surroundings and terrorizing our designer Ryan, Logan settled into his comfy bed by my desk. Like our blue wall? Anyway, he had a peaceful day except for when the UPS delivery guy and the mailman interrupted his sleep. This test proved to be a success so Logan, no doubt, will be returning to the office soon.